Social identity can be identified as a social glue which enables individuals relate to their ingroup and make prominent continuing efforts on behalf of the collective society. Identifying with a social group has lead to many consequences. Researchers have observed and outlined the following. Mummendey, Kessler, Klink, and Mielke, 1999 social competitiveness. The concept of social identity is analogous to that of a double edged sword which can yield both positive and negative results. 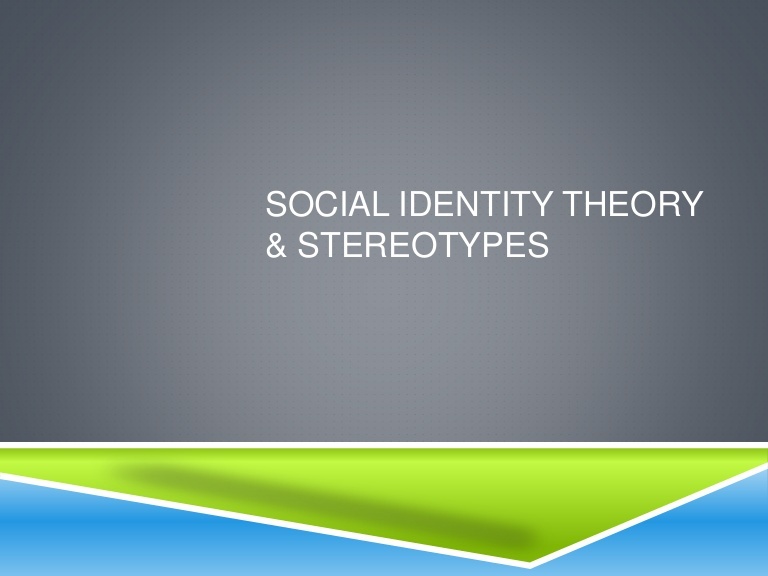 In order to find out which dimensions of social identities are related to positive or negative outcomes a broad framework is required. Social identity theory or SIT is identified as a relevant and useful framework to explain intergroup phenomenon (Brown, 2000). The central idea of the approach is one’s social identity which is explained as “that part of the individual’s self-concept which derives from his or her knowledge of membership to a social group (or groups) together with the value and the emotional significance attached to it” (Tajfel, 1981). The degree to which individuals identify within their group, aspire for a positive social identity can be evaluated by finding the favorable comparisons between the ingroup and outgroup on a major dimension of comparison. SIT results have produced that ingroup favoritism is a functional element that makes up for the need to differentiate from the outgroup and enhance group members’ positive social recognition. While Ingroup bias is definitely beneficial it may also harm both the victim of ingroup bias and the perpetrator. Social identity may act as a buffer against harmful impact of stress(Haslam, 2004). Results of an analysis conducted on a group of employees working in stressful conditions showed that when identified with their organization, they show higher organizational citizenship behaviors and job satisfaction. Hence identifying within one’s ingroup can bring about a variety of positive outcomes. Different Dimensions and Forms of Social Identity By investigating the motivational orientations that exist in social identity the reason for the divergent findings can be traced out. The specific form of social identity creates a variation in the prediction of negative outcomes like ingroup bias. Patriotism represents feelings of attachment, responsibility and pride and is believed to be a more positive form of national identification. As per SIT nationalism directly taps into that component of social identity that creates ingroup bias. It also may lead to feelings of chauvinism, superiority or derogatory comparisons with other countries. According to Jackson and Smith a secure social identity is one that involves strong ties with the ingroup but discourages the notion of a socially linked fate, depersonalization and intergroup competition. In 2002, Tyler and Blader considered orientations(autonomous and comparative) of students to their university and employees to their companies to bring into view the other dimensions of social identity. Autonomous orientation refers to application of internal standards like norms, values by group members for self evaluation while comparative orientation is application of external standards and social comparison processes. Reportedly, autonomous orientation predicted more positive consequences both at individual level(self esteem) and group level(cooperative behavior). One’s own endorsement of norms and values that tie him intrinsically are also relevant especially during prediction of positive consequences. There are certain conceptual similarities between the 2 modes of social identification and dimensions(autonomous and comparative) of social identity. The concept of group glorification includes the motivation to analyse the ingroup in the fairest way, denying any criticisms. On the other hand group attachment represents commitment and inclusion of the group in the self concept. Findings have shown that ‘group attachment’ predicted a higher degree of group based guilt towards the ingroup’s responsibility in an intergroup conflict than ‘group glorification’. It is hence seen that investigating the various dimensions of social identification is seemingly a result-oriented avenue for future research in order that the positive vs. negative consequences can be traced out. Motivations Underlying Social Identity: There are many reasons why individuals identify with their social group. Social identity is encouraged by the necessity of acquiring and retaining group distinctiveness (Tajfel & Turner, 1979). 6 motives outlined for identification were esteem enhancement, identity, continuity, self-efficacy, meaning and distinctiveness. Research showed that these motives can predict the degree of importance of different identities for each individual. To find out the reason people identify with groups a motivational theory was adopted This theory covers a large spectrum of motives relating to human behavior with more stress on the quality (than quantity) of one’s motivation. Amotivation : It refers to the feeling that identifying with a social group will not lead to results desired. (Ryan & Deci, 2003). External regulation: It involves identification with one’s ingroup to get accolades or to minimize impunities. Introjected regulation: It involves identities borne out of pressurizing oneself . Identified regulation: It deals with priority to oneself and stressing on valued goals . Integrated regulation: It includes the identities which pave way for expressing one’s deepest values and beliefs. Intrinsic motivation: The most self determined form of motivation is intrinsic motivation. Identifying with a social group brings inner happiness and ensures security. The findings after application of SDT have shown that behaviours owing to self determined reasons have more chances of positive consequences like greater persistence, deeper concentration and increased psychological wellbeing. On the contrary behaviors arising out of non-selfdetermined forms lead to undesirable consequences from the perspective of the individual and those related to him (Deci & Ryan, Vallerand). This theory has worked well in many spheres affecting life like academics, sports, interpersonal relationships etc. Currently SDT is used as organizing framework in order to apply group members’ motivations for identifying with their social group. The theoretical framework takes into consideration these motives and organizes them into a continuum in order to predict the positivity or negativity of results. These can be assimilated as introjects and can be integrated well into the self where they can serve as abiding guides to life.